Cal-Organic Farms started with a quarter acre of lettuce and the determination to do things differently. More than three decades later, we’ve grown to produce more than 65 seasonal and year-round vegetables and we’ve been able to increase our organic acreage year after year. We’re driven by a responsibility to care for the land and for our customers, and we’re proud to promote family values and integrity in all that we do. Family-owned and operated, our farming practices have been handed down from generation to generation. 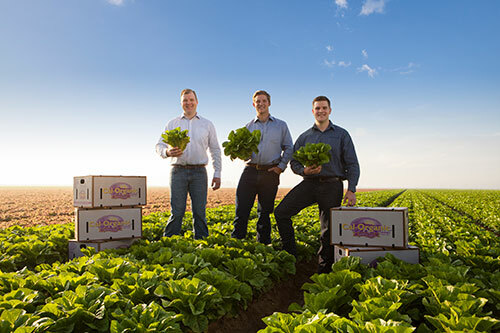 We are proud to grow 100% of our produce on family-owned acreage in the USA. Our farms, facilities, and fresh produce exceed USDA standards for organic certification. As stewards to the land, we strive to reduce waste, save energy and utilize more renewable resources. The Duncan Family started Cal-Organic Farms with just a quarter acre of land in Lamont, CA. Cal-Organic joined Grimmway Farms to expand distribution and make quality organic produce more widely available to consumers. Cal-Organic was named Vendor of the Year by Wild Oats Markets. Cal-Organic opened a produce stand in Tehachapi, CA and welcomed the public to purchase organic fruits and vegetables right from the farm. We continue to open the stand each summer from June to September. Cal-Organic received the Supplier of the Year award from Whole Foods Market. Albertsons Companies of Southern California recognized Cal-Organic Farms as Produce Vendor of the Year. Today Cal-Organic is the largest organic vegetable producer in the United States. Supplying more than 65 seasonal and year-round varieties, we are proud to grow 100% of our produce on family-owned acreage in the USA. Meet the team that keeps Cal-Organic growing. Follow us for inside look at organic farming. Join an innovative company making a global impact.